The Independent has put its green columnist Julia Stephenson on to Panorama’s Wi-Fi scare story: a charming green party candidate and beef heiress living in Chelsea on a trust fund, who believes her symptoms of tiredness and headache are caused by electromagnetic radiation from phones and Wi-Fi. This is genuinely fascinating: from the article in today’s Independent, electrosensitivity now seems to be growing into an explicitly alternative diagnosis, to go with alternative therapies. For this article your Bad Science Bingo high scorers are: q-link, homeopathy, misrepresenting Sweden, and ignoring the provocation studies. Wi-Fi Wants To Kill Your Children… But Alasdair Philips of Powerwatch sells the cure! Hello visitors from boingboing/slashdot. 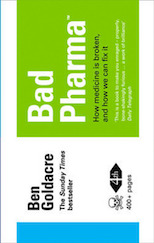 I’m a doctor and I write in the Guardian and the BMJ about quackery, health scares, and pseudoscience in the media. Won’t somebody, please, think of the children? Three weeks ago I received my favourite email of all time, from a science teacher. “I’ve just had to ask a BBC Panorama film crew not to film in my school or in my class because of the bad science they were trying to carry out,” it began, describing in perfect detail the Panorama which aired this week. I’ve just been sent this by the BBC publicity office, it is a response from Paul Kenyon, the presenter of the show, and very nice chap too. This has fallen into my hands. It is – I am informed – the letter that the BBC complaints people are planning to send to people if they complain about the ludicrous Panorama Wi-Fi show from Monday, featuring Alasdair Philips and electromagnetic hypersensitivity. Normally I’d ignore quack medical devices, but when the catalogue from Health Products For Life – run by vitamin pill salesman Patrick Holford – arrived, I found an unexpected treat waiting for me. Among his usual “special formulation” pill-peddling banter, there was the QLink pendant, at just Â£69.99. The QLink is a device sold to protect you from those terrifying invisible electromagnetic rays, and cure many ills. “It needs no batteries as it is ‘powered’ by the wearer – the microchip is activated by a copper induction coil which picks up sufficient micro currents from your heart to power the pendant.” Says Holford’s catalogue. According to the manufacturer’s sales banter, it corrects your energy frequencies. Or something.